I have a manuscript I call a sci fi thriller. Dream Flyer. Dean receives neurotrophic drugs & dreams of Tesla’s lost papers. Cindy helps him escape. Whose side is she on? An editor from a large publisher read it & liked it, but he had to reject it because I wrote it like a thriller (which I did). My question is how do I write science fiction so that it doesn’t read like a thriller? Less action & intrigue, paying more attention to the scientific details? In other words, would I need to explain the science, rather than keep the plot running fast? 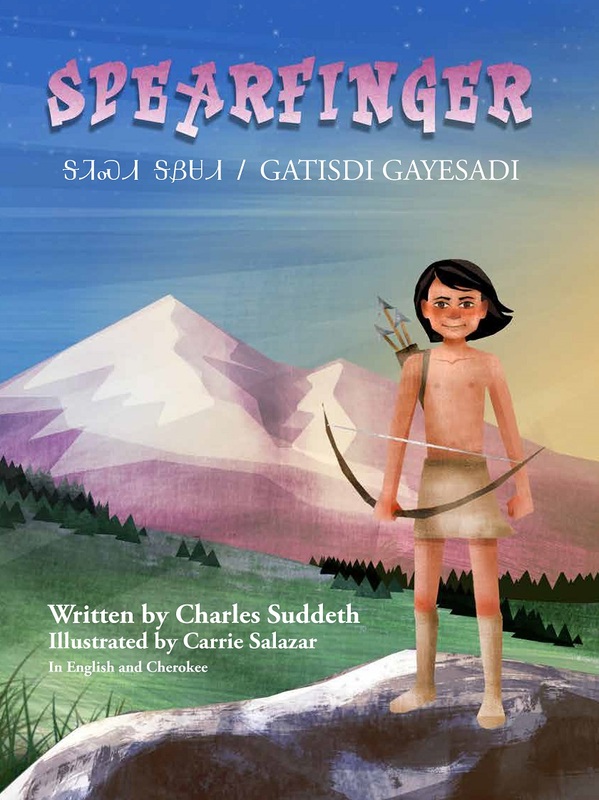 My picture book, Spearfinger, traditionally takes place in the Snowbird Mountains/Nantahala River valley of North Carolina, but I like to think Spearfinger could have haunted many places where the Cherokees lived, even in Kentucky where I live. Kentucky means “meadowlands” in Cherokee. Whiteside Mountain, in the Snowbirds, is her rumored home. Spearfinger was reputed to have haunted the Nantahala River Valley. Some say that Whiteside Mountain is her home. Contains 60 pages of full-color illustrations and text in English and Cherokee. Spearfinger can be found at http://www.4rvpublishingcatalog.com/charles-suddeth.php other online bookstores, and through brick and mortar bookstores. Spearfinger is the #1 New Release in Children’s American Folk Tales & Myths [Amazon]. Contains 60 pages of full-color illustrations and text in English and Cherokee. Spearfinger can be found at http://4rvpublishingcatalog.com, other online bookstores, and through brick and mortar bookstores. These are non-fiction picture books written like a story, where the reader doesn’t what to expect next or how the story will end. The reader learns something new while enjoying the picture book. Unlike plot-driven stories, linear stories (AKA incident stories) are made up of a series of incidents flowing from one to the next, each incident having about the same weight/importance. The protagonist moves through the incidents without really changing or learning anything. So, linear stories tend to be about typical days in the protagonist’s life, rather than extraordinary days required for a plot. Linear stories are often bookended by a beginning (waking up, arriving at Grandma’s house, leaving for the beach) & an end (going to sleep, leaving Grandma’s, watching the sun set at the beach before going home) to create a satisfying structure. However, linear stories only work if they do something special. The language may be rhythmic & beautiful, the series of events surprising or absurd, or the incidents themselves infused with humor. This is plot-driven and/or character-driven fiction with beginning/middle/end. Stories where the reader doesn’t know the stories will end. This is what I write! My picture book, Spearfinger, is about to be released. It is definitely fiction.